Why Don't 'Anti-Fascists' Fight Islamofascism? 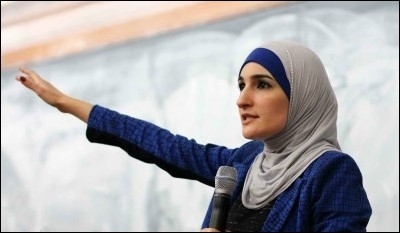 Islamofascist Linda Sarsour will deliver a commencement address at the City University of New York June 1. Seventy-two years ago this Friday, on May 5, 1945, Hitler's fascist dream of a "Thousand Year Reich" lay in ruins, as Berlin fell to the Red Army, only to find the ashes of the "Fuhrer" who had shot himself five days earlier. On the very day Berlin fell to the Soviets, British Prime Minister Winston Churchill ordered an appraisal of "the long-term policy required to safeguard the strategic interests of the British Empire in India and the Indian Ocean." Two weeks later, Churchill received the top-secret report that, among other proposals, cited the necessity of a British presence in northwest India (today's Pakistan) "from which British air power could threaten Soviet military installations." When this was brought to the attention of the leaders of India's freedom movement, they made it clear to Britain they would not accept British bases on Indian soil after independence. On the other hand, the leader of the All Indian Muslim League, M. A. Jinnah, was amenable to the idea, and so was laid the foundation of the Islamic Republic of Pakistan -- that would serve the West in fighting Moscow. It's no coincidence that within a few years, Pakistan joined the West in two military pacts against Moscow — SEATO and CENTO. Today, a new fascism is in the air, one that also speaks of rule over the planet, not just for 1,000 years, but until the end times. As in the 1930s, the West and its citizenry seem unconcerned about the threat of rising fascism. But like the rise of fascism in Germany, Italy and Spain in the 1930s, the West and its citizenry again seem unconcerned or unaware of the catastrophe that may unfold. Even in the 1930s, when the Spanish Republic stood up to the Hitler-backed fascists of Francisco Franco, the UK and US refused to help the elected government in Madrid, leaving it to left-wing activists from around the world to join the war on the side of the Republic. These included Canadian volunteers of the Mackenzie-Papineau Brigade (popularly known as the Mac Paps). Today's fascists have an additional advantage over the Franco-Mussolini-Hitler types. They are Islamofascists, who not only seek authoritarian supremacy, but claim to possess a divinely ordained doctrine to justify annihilating democracy, liberty, freedom of expression, and the equality of men and women. I am not just referring to ISIS, the Islamic State in Iraq and Syria, the Taliban in Afghanistan, al-Shabab in Somalia or Boko Haram in Nigeria. These are the fringes of Islamofascism. The two main players are in Pakistan, created by Britain and armed by America, and the authoritarian dictatorship of Turkey, that is still sustained by NATO. Unlike the years leading up to the last Great War against fascism, this time the left in the West has deviated from its historic role and is today an ally of the Islamists. Two recent incidents highlight this problem. In India, the Islamic University of Jamia Milli has conferred an honourary doctorate on Turkish President Recep Tayyip Erdogan, despite the dictator's vicious crackdown on dissenting Turks and ruthless treatment of minority Kurds. And in the United States, the City University of New York has invited radical Muslim activist, Linda Sarsour, to deliver a commencement address June 1. Abraham Foxman, former head of the Anti-Defamation League, says, "She's [Sarsour] a bigot, and she shouldn't have been invited [to CUNY]." With universities honouring such individuals, where does an old-fashioned "AntiFa" (anti-fascist) like me, whose licence plate says, "Mac Pap," go?